Timber is sawn in the direction of grains. All members of frames are of same species of timber and be straight without any warp. The frames are smooth, well planed surfaces except the surface touching wall lintel sill etc. The rebate is done before members are joined into frame. The thickness of rebate is 15 mm and the width is equal to the thickness of shutter. If wire gauze shutter is to be fixed, two numbers of rebate should be made. A door frame consisting of three wooden members i.e. two upright posts called jamb posts, which are jointed with top piece called cross piece or head. 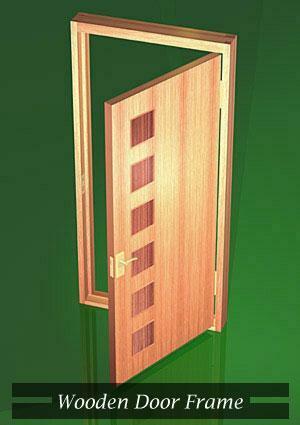 Nominal size of door frame for single shutter is 75 MM X100 MM and for double shutter 75 mm X 125 mm. The door frame is jointed with mortise and Tenon joints as this joint is the strongest one. The length of jammed post/vertical post should have extra length of 40 mm from door opening for embedding it into the floor. The top corner of the frames is secured with G. I. sheet and iron screws. The back portion of door frame which in contact with walls, lintels sill etc. is painted with bitumen or any anti-termite chemical. Each prepared door frame is fitted with temporary stretcher at bottom to keep the frame in position. The frame is in true to right angle. To protect door frame during construction priming coat is done before fixing. A nice wooden door frame. The door frames are mostly in use after 1990. These should be manufactured from reputed manufacturer. Aluminum door window frames should be according to IS: 1948 and I S: 1949 on manufacturing. 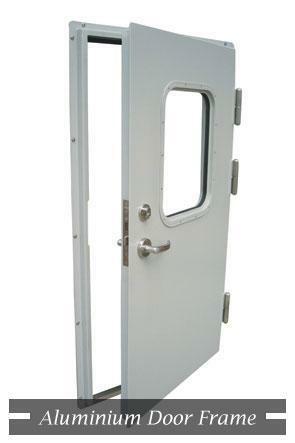 Generally size of aluminum door frame available in the market is as given below. Aluminium Door Frame - very solid. These frames are made from T. Iron and all other procedure is the same as for angle iron door fame. 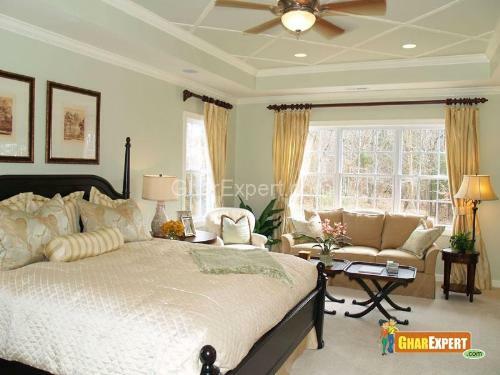 In this section we will discuss about window frames. Window is an opening into the wall for providing daylight, ventilation and to view outside look. It has two parts: one is window frame and the other is shutters. 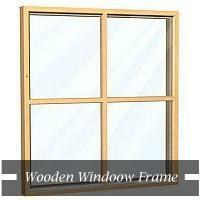 All other specifications of window frame are the same as for door frames given above. Frames are fixed in opening abutting masonry or concrete with iron hold fast. Hold fasts are embedded in cement concrete block 1:3:6 ratios in the masonry walls. While fixing frames it should be in plumb, level and in straight line. Door and window frames can be fixed in masonry either at the time when work is in progress or in the opening left in masonry for fixing frames. Vertical members of door frames are embedded in the floor for full thickness of floor finish. Bedroom with big size wooden window for a bigger view...just amazing! The spacing recommended for fixing hold fasts vary for different types of frames. For wooden frame: Minimum three hold fasts are fixed on each side of door frames; one at the center point and the other two at 30 cm from the top and the bottom of the frame. For M.S. steel frame: Three lugs /hold fasts are provided on each jamb spacing not more than 75 cm. For aluminum door frame: In aluminum door frames, the frame is fixed with four numbers of lugs/hold fast as given below. First number at 45 cm from the bottom. The second number at 109 cm from the bottom. The third at 139 cm from bottom. Note: If the width of opening is more than 80 cm, two numbers of lugs should be provided on the top member of the frame.